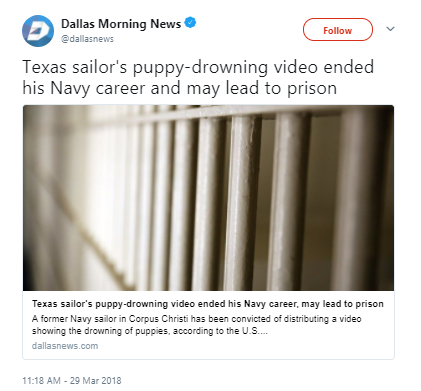 A former Navy sailor from Texas has been convicted of distributing video that shows puppies drowning, as well as being in possession of videos depicting the torture and killing of animals, according to the U.S. Attorney’s Office for the Southern District of Texas, and he could face up to seven years in prison and a $250,000 fine. Former Petty Officer Third Class Daniel James O’Sullivan, 26, was found guilty of distributing the disturbing video following a complaint in June 2016. Depictions of serious bodily injury – via photograph, motion picture film, video, digital recording or electronic image – to living mammals birds, reptiles or amphibians is illegal under federal law. O’Sullivan received an “other than honorable” discharge from the Navy in September 2017. His sentencing takes place on Aug. 2. He faces up to seven years in federal prison and a possible $250,000 maximum fine. O’Sullivan was interviewed at Naval Air Station Corpus Christi, where he was stationed at the time.